Links to Louisiana farmers' markets. Shopping at a farmers' market is a great way to meet local farmers and get fresh, flavorful produce some even have live entertainment. The Market serves as a center of commerce, a community gathering place and revitalization tool for our Central Business District. It is recognized nationally as a thriving example of a public/private partnership. Main Street Market is very proud to be supported by both the Baton Rouge Area Foundation and the State of Louisiana. The success of the Red Stick Farmers Market, a producer-only market, creates a direct sales marketplace and provides a sustainable livelihood for small Louisiana agribusinesses. In return Red Stick Farmers contribute to the cultural and economic well being of surrounding rural areas. 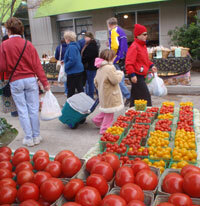 The German Coast Farmers' Market serves as a community gathering place, tourist destination, and a market for a wide range of fresh vegetables, fruits, flowers and other value-added items in the parish of St. Charles. Seeks to strengthen farmers markets' capacity to serve farmers, consumers, and communities by providing the rapidly growing movement with information and representation at state and federal levels. We help build networks, link peers, and connect farmers markets old and new with tools and resources for success. NAFMNP is a non-profit corporation founded in 1992. It is the nation's only organization that links States, the District of Columbia, Indian Tribal Organizations, Territories and others with a stake in USDA's Farmers' Market Nutrition Programs (including local fruit and vegetable growers and low-income families and seniors) with a shared mission.